Play a part in keeping our lakes, streams and rivers clean. A major threat to our woodlands! Enjoy Kevin Haight's chronicle of his paddle from the Paw Paw Maple Lake Dam to the confluence with the St Joe River - 66 river miles! Welcome! Explore and discover the Black and ..
Paw Paw River Watersheds with us! Learn what you can do to help protect and improve the wonderful resources in these watersheds. Learn about the Two Rivers Coalition, Inc., a citizen based group working to protect the health of the Black River and Paw Paw River Watersheds through conservation, education, and advocacy. 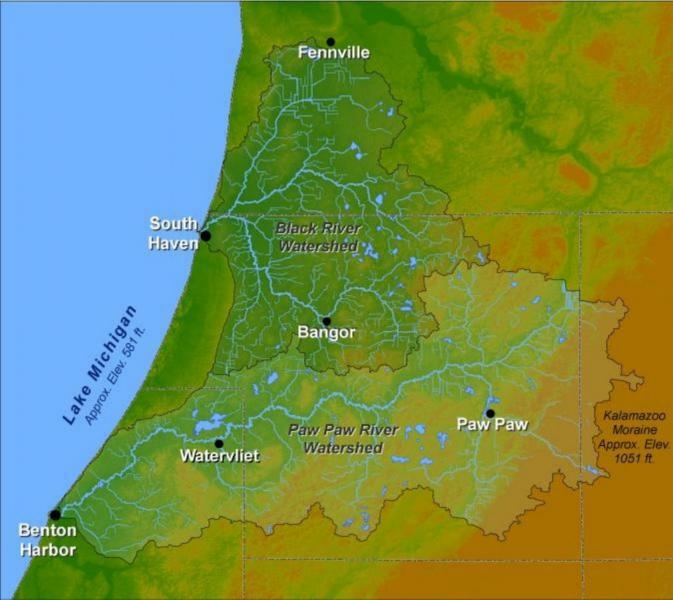 Our goal is to be your source of information about the Black and Paw Paw River Watersheds here in Southwest Michigan. We hope our web site will provide you with accurate and thought provoking information about these watersheds and the community we live in. We believe that an informed and engaged community is the key to making this one of the best places to live and play. Please look around and let us know if there is information that you would like for us to include on our web site. Looking for a specific topic? Try Search at the top of the page. The Black and Paw Paw Rivers drain lands in Allegan, Berrien, Kalamazoo and Van Buren Counties. The Black River flows into Lake Michigan at South Haven. In Benton Harbor, the Paw Paw River flows into the St. Joseph River which then flows a short distance to Lake Michigan. Some say that the St. Joseph River is actually the Great South Branch of the Paw Paw River. Attendees of the TRC 10th Annual Meeting on November 8, 2018 were treated to a highly informative and persuasive presentation by Dr. David Karowe of WMU. He explained the scientific evidence which absolutely establishes the dominant role humans are playing in the warming of the planet. He went on to explain what life will be like in the Great Lakes by the end of this century under two scenarios: business as usual (do nothing) or return to the Paris Climate Agreement. There will be rising summer and winter temps, earlier and more severe spring floods, more frequent and more intense rain events, and more severe late summer droughts. We could lose iconic tree species like White Pine and Sugar Maple. Bottom line is that if we do nothing different, by the end of the century we will not recognize the place we call Michigan. But, if we act quickly, we can still choose the type of planet we leave to future generations. 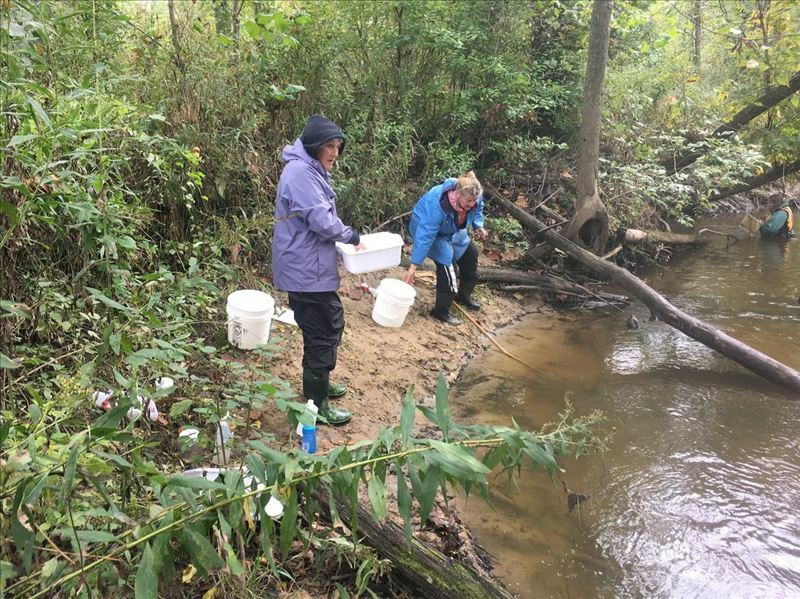 TRC and VBCD are proud to be embarking on their 6th season of sampling streams for macroinvertebrates (aquatic insects) to assess water quality and stream health. Volunteers meet at River Park in Lawrence at 9:00 a.m. for coffee and donuts as A.J. Brucks explains why we are collecting critters and what the protocol is. Then we divide up into teams headed by an experienced leader and carpool out to various stream locations. Some people will don waders and wade out into the water to scoop up critters from likely hiding places under submerged logs, overhanging banks, etc. Other folks will set up a station on the stream bank to sort through debris that comes out of the nets looking for anything that moves to put into our collection jar. Most teams will go to two different stream or river locations and we are almost always done by noon. This is a fun family event for kids as young as 10. Dress warmly and expect to get a little wet and muddy (part of the fun). On Monday May 6, volunteers and some professionals will meet at the VBCD office in Paw Paw to go through all the collections jars and identify the insects collected. At its July meeting, the TRC Board of Directors passed a resolution calling for the immediate shutdown of Line 5 which carries crude oil products under the Straits of Mackinac. My job is not to convince anyone of the correctness of this decision, but rather, to explain why we felt it was an appropriate action for a local environmental group to take. Remember, the mission of TRC is to…”protect the health of the Black River and Paw Paw River watersheds through conservation, education, and advocacy.” As a water quality organization, we believe it is just not enough to work to protect the water only until it runs into Lake Michigan. The fact that all of us here in SW Michigan are part of the Lake Michigan watershed, and in turn, part of the Great Lakes Basin watershed, cannot be ignored. 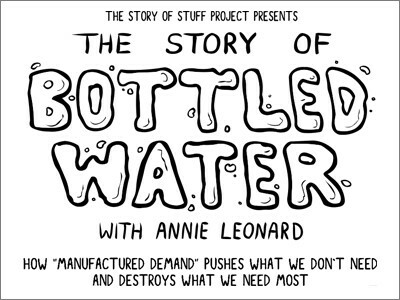 Most importantly, we believe that everyone in that vast but fragile watershed, containing 20% of the world’s fresh water, has some responsibility to do what he or she can, to be a responsible steward of that tremendous natural resource. What TRC can do, as a regional environmental group focusing on water quality, is bring attention to potentially catastrophic threats to the waters and ecosystem of the Great Lakes. We are providing links to resources where people can go and get more information and then make up their own minds about how great the risk is and what their personal risk tolerance is to possible environmental catastrophe. THEREFORE, Two Rivers Coalition calls upon elected state and federal governmental representatives and relevant regulatory entities to immediately shut down Line 5. 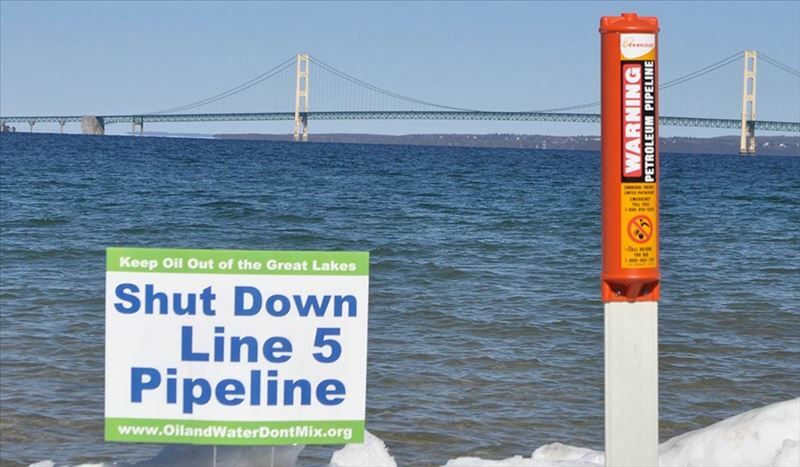 Watch the Oil & Water Don't Mix video presentation about Enbridge Line 5 in the Straits of Mackinac. You can submit a comment to the State of Michigan about Line 5 from either of these websites. Monday, May 6, 2018 - I.D. Volunteers gathered together at 9am to learn about the Volunteer Steam Monitoring Program and Insect Collections in the Paw Paw and Black River Watershed, Van Buren County. Two Rivers Coalition and Van Buren Conservation District introduced their board members and staff and gave a short update of their organization. Individuals were divided into six teams, assigned a team leader and sent off to their designated locations with the proper equipment. The following day, volunteers met at the Van Buren Conservation District office to sort and identify species from each collected site. Each Team had a table with tools and equipment to help sort, identify and assess the quantity of the species found at that specific site. Photos were taken of specimens and water quality was assessed by counting the sensitive, somewhat sensitive and toler-ant species found. Motion - August 12, 2015 Board Meeting: TRC officially endorses petition to ban fracking in Michigan because of potential threat to ground water and surface water resources in Michigan. 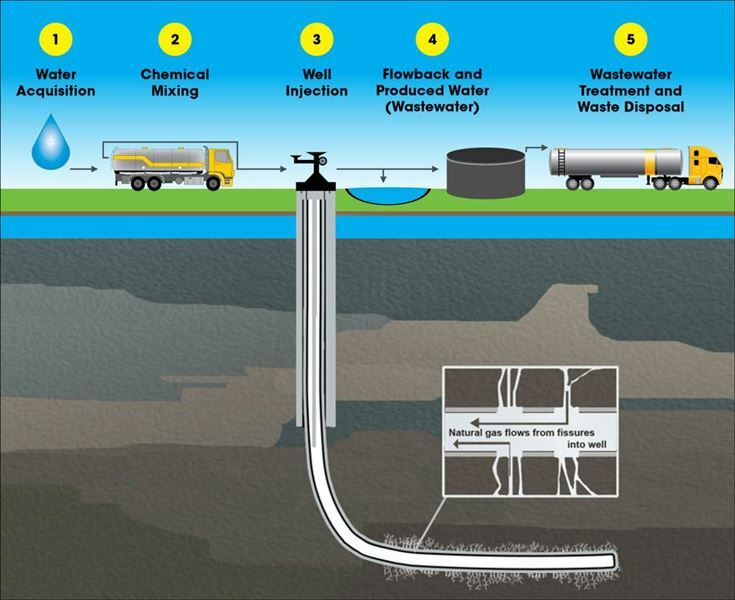 An initiation of legislation to prohibit the use of horizontal hydraulic fracturing or “fracking” and acid completion treatments of horizontal gas and oil wells; to prohibit emission, production, storage, disposal, and processing of frack and acidizing wastes created by gas and oil well operations; to eliminate the state’s policy favoring ultimate recovery of maximum production of oil and gas; to protect water resources, land, air, climate, and public health; and to allow residents to enforce the provisions of this ballot language, by amending Public Act 451 of 1994 entitled “Natural Resources and Environmental Protection Act,” by amending section 61528, 61529 and 61530. April 18, 19. 20 VBCD Tree Seedling pick-up/sale. Sunday May 5- Volunteer Stream Monitoring/Macroinvertebrate Collection, 9:00 a.m. at River Park in Lawrence. Scroll down middle column to "Upcoming Events"for more information. Scroll down middle column of page for details.